Naomi and Ely have been best friends and neighbours for as long as they remember themselves. Naomi is straight and Ely is gay, and so to avoid hurting their friendship they have come up with a No Kiss List: a sort of written promise not to kiss any of the boys they’re both attracted to. But one day, Ely confesses he kissed Bruce, Naomi’s boyfriend. And that leads to a major fight: not necessarily because of Bruce himself, but because it turns out that knowing Ely is gay didn’t stop Naomi from developing some complex feelings about him. As far as she's concerned, there's something behind their constant “we should get married here” jokes. This story is told from multiple perspectives: Naomi’s, Ely’s, Bruce’s, the other Bruce’s, Gabriel the doorman’s, etc. I tend to prefer fewer narrators, but in this case, it really worked. This is a short book, but there are actually quite a few characters and subplots, which all have a common theme: relationships, and how complicated even the simplest of them can be. I loved this book so much. It’s smart and bittersweet and wise, and it doesn’t try to oversimplify things. When I say it’s about how relationships can be complicated, how friendship can be as tricky as love, I don’t mean it in a negative way. By “complicated” I mean that they need a similar kind of commitment, honesty and openness to work. The point about friendship not being all that different from love is made several times throughout the book, and this is something that really speaks to me. However, people tend to misunderstand me when I say this. I don’t mean you could replace your significant other with your best friend tomorrow and not notice much of a difference. But what I believe is that the reason why not is not because your significant other has some essential irreplaceable quality that makes them perfect for you, but because of the joint memories and meanings and connection that you build over time, the degree of closeness you achieve. That’s the bottom line, really: both in friendship and in love, closeness is something you build, something you have to keep perfecting and working at. Yes, I know Bruce will never look good on the dance floor. I know he’s got issues. I know he’s a mutant. I just have to convince him. The same way he needs to convince me he doesn’t think I’m reckless and heartless. We know it won’t all happen now. And it can’t ever happen perfectly. But we can get close. Just so you know, the “mutant” thing is a reference to a conservation they have earlier. But anyway: aww. There is also the fact that Bruce had never actually been with a boy before Ely, and there’s a painful conversation he has with his mother, and…I won’t tell you everything. But it’s beautiful, even if it's not simple. I just loved the characters so much. I think I remember hearing people say they didn’t like Naomi, and I can see how she’s not your traditional likeable character. But you know what, she’s beautiful and she breaks hearts and she knows it, but she’s also smart, and she knows there’s much more to her than her looks. And though she can be manipulative, she’s sensitive enough to realize it when she’s doing to others what was done to her, and to stop before she hurts anyone further. So yes: I liked her. And plus, it was very easy for me to sympathize with her hopes and expectations regarding Ely. And with her pain, which is very real and not something that can be dismissed with a comment like “you silly girl, don’t you know he’s gay?” I can’t imagine being Naomi and not ending up as hurt and confused as she was. Not while their relationship crossed some boundaries but not others. Not while they were still trying to figure out just how close and how distant they needed to be. I also loved Gabriel the doorman, who has a crush on Naomi and makes her a mixed tape with songs by Belle & Sebastian, Jens Lekman, Elliot Smith, Fiona Apple, Nina Simone, etc. This is a detail, but I can’t remember the last time I read a book in which a doorman was portrayed as a real person and not just a prop. But this is the kind of book in which every person is a person, and I loved that. I thought when I found the right person, it would be easy. He would be mine and I would be his and that would be that. And with Naomi. I would be hers and she would be mine and that would be that. The perfect friendship. The ideal. What kind of tension could a straight girl and a gay boy have? None. Easy. No. No no no no. It is not easy. Things that matter are not easy. Feelings of happiness are easy. Happiness is not. Flirting is easy. Love is not. Saying you’re friends is easy. Being friends is not. I thought Naomi and I had perfectly matched up our vocabularies and our definitions. But that’s just not possible. There are always meanings that are different, words that are heard differently than they’re said. There’s no such thing as a soulmate…and who would want there to be? I don’t want half of a shared soul. I want my own damn soul. I think I’m going to learn to appreciate the world close. Because that’s what Naomi and I are. Not identical. Not soulmates. But close. Because that’s as far as you should ever get with another person: very, very close. I could have stayed over with Bruce, but this is where I wanted to end my night. This is what I wanted to come back to. This is as much a part of my story as anything else. Friendship is love as much as any romance. And like any love, it’s difficult and treacherous and confusing. But in the moment when your knees touch, there’s nothing else you could ever want. Wonderful review. You've made me want to go out and buy this book right now, it sounds amazing. I love the quotes you picked out. This sounds so fun - I love these types of books. It's on my TBR list. Wonderful review (as always). Great review and I loved the quotes. It remeinds me of a girl I knew in HS who had a crush on her best, who was gay. I loved your review. I'm trying so hard to not add more books to the TBR list, but I think this one is going on it. WOW...love love love your review. And the writing is so beautiful, simple yet nice. Obviously this goes on my wishlist. This sounds like a wonderful book about friendships and relationships. This definitely sounds like a book for me. Thanks, Nymeth! I'm putting it on my wishlist. This really sounds like an interesting book. I will definitely want to read this one and will add it to my list. Thanks Nymeth. This sounds so, so, so, so, so, so, so, soooooo freakin' good! 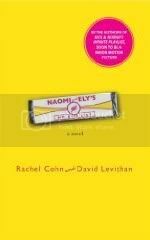 I've really been wanting to read something by David Levithan. (Bad Debi for not having done so already!) I thought I wanted to start with Wide Awake, but I don't know...I'm not sure I can resist this one! Thanks Nymeth! Unfortunately I didn't find the characters of Naomi and Eli as agreeable as others have found them, still the I found the book to be ok. Much preferred Nick and Norah. I loved Nick and Norah. I kept meaning to look for this one too, and now your review has moved it up the list. Excellent review! What a wonderful premise for a story, so real. I'll bet this happens more often then we imagine and the author deals with this complicated heartbreak with tremendous clarity and sympathy. This one is going on the list. Thanks! Sounds like a really fun book. I will have to keep my eye out for it. Thanks! Nely, thank you so much :) I really hope you enjoy it. Carolsnotebook: I bet that happens quite frequently! Meghan and Scrap Girl: I hope you both enjoy it when you get to it! Debi: It iiiis! This was actually my first time reading Levithan too. I started here because Renay said the ones he wrote with Rachel Cohn were better than the solo ones. I can't wait to get my hands on Nick & Norah! Lisa: I need to look for Nick & Norah! I bet I'll love it too. Jaimie, I bet so too! Zibilee, I hope you enjoy it! It is fun, and sweet and sad and serious at the same time. I'd like to read this! I read Nick and Norah and enjoyed it, but I had a hard time stopping myself from comparing it to the film. I'd like to try another book by the same authors, but without a film lurking in my mind. Ah! You beat me too it ;) I have this one on my wishlist. Ever since seeing Nick and Norah's Ultimate Playlist, I've been dying to read more Levithan than just the short story I've read. Loved that story. After adding this book to my wishlist, I researched a bunch of Rachel Cohn's stuff as well and it all sounds great! There's one called Gingerbread that I really want to read. Great review! It sounds like a really interesting book! Are these the same people who wrote The Infinite Playlist? (Nick and Nora's, maybe?). Sounds like a really beautiful book that captures a lot of the confused and complicated feelings of teenagers--that whether we are gay or not we could relate to once upon a time. I'm so glad you liked it so much--I'll have to look out for both of their books. Anyway, I think you're so right about friendships and their complexity. Sounds adorable! Thanks for the review! Jenny: That always happens to me too. I try to read the book first, but then that often ruins the movie, or conditions my appreciation of it at least. Chris: lol, it's not a race, is it? :P I really think you'd like this! And I remember you mentioning Gingerbread before...it does sound awesome! Trish: Yep, they are! I haven't read or watched it yet, but it does sound great too. Okay, this just went straight onto my List. Just reading your review made me tear up. Okay Nymeth, now you're getting evil :P This book was firmly planted on my "Not Interested" list - when I looked at it in the library I kinda snorted and thought to myself "oh puuuleeze this is Will & Grace for teens!" Now I read your review and see that I must read this book - you make it seem like it's so much more than just a silly sitcom clone! I hadn't heard of this book before but it sounds wonderful. I know what you mean about multiple narrators, I typically prefer just one or two but when it works it can really be effective and a good way to explore all the characters! This does sound very good, now I want to read it. 'both in friendship and in love, closeness is something you build, something you have to keep perfecting and working at'-well said. This does sound good. I love the quotes you included and I love stories that explore relationships truthfully with all their complications. Another one for the wishlist! what a beautiful review! I agree completely with your views about love and friendship, and how much they resemble each other. If you want to read a book with a prominent doorwoman character,you could try The Elegance of the Hedgehog. My best friend strongly recommended it to me so I'm going to read it soon, I hope! Shanra: lol, I've actually been reading a lot of first person books lately for some reason. I finished Affinity by Sarah Waters recently, and that was another one. Memory, I hope you enjoy it! Iliana: It has to be very well done, but it really can! Naida: I'm glad you agree! I hope you enjoy the book. tanabata: How I wish there had been YA books with this kind of honesty and insight around when I was a teen! Valentina: I can't imagine you not liking it either! And The Elegance of the Hedgehog is one I've been meaning to read too. Thanks for the great review, Nymeth! You know how much I adore stories that's bittersweet! ;P This will be going onto my wishlist!!! I just finished this one and loved it! I was searching for links for my review (I'm a bit behind on my blog reader) and found yours! Synchronicity is fun. I was sad to say goodbye to these characters when the book was over. read your review. i must say although i wanted to get a copy, part of me doesn't simply because I'm just like Naomi. 5 yrs have passed and things still hurt like it's the first yr. Though the book may sound realistic, trust me, reality is much more complicated than this book. Cool review btw. Hopefully I'd get to have this book one day.